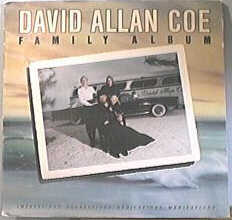 Family Album is an album released by country musician David Allan Coe. It was released in 1978 on Columbia. All Songs written by David Allan Coe except where noted. 1978’s Family Album features one of the most bizarre covers in David Allan Coe’s — hell, anybody’s — catalog. He is dressed in a minister’s black, flowing robe with an Amish hat, a little blonde girl in his lap, his two — yes, two (of three at one time) — wives standing behind him, and behind them, a black Lincoln Town Car and Coe’s Silver Eagle tour bus. The album is dedicated to his two mothers — he’s apparently from a Mormon family — and stipulates how difficult it is for a child to have two mothers. It’s so surreal one is almost afraid to play the recording. Family Album marks the first time Coe worked with Billy Sherrill as well as his regular producer, Ron Bledsoe. It begins with the title track, dedicated to those mothers, and you never know which one he is speaking of — though it hardly makes a difference, it’s a beautiful country song. “Million Dollar Memories,” co-written with Carol Anderson, is a honky tonk piano number stylistically reminiscent of Jerry Lee Lewis’ Mercury years and of his cousin, Mickey Gilley’s piano work, played wonderfully by Hargus “Pig” Robbins. 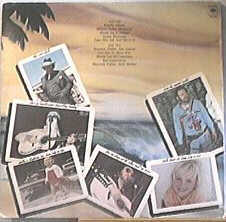 The album also features Coe’s first attempt at emulating Jimmy Buffett with “Divers Do It Deeper,” an excellent choice for the guy in a minister’s robe on the cover. This song belongs somewhere, but not on this recording. Other worthy honky tonk numbers here include “Guilty Footsteps,” “Bad Impressions,” and “Whole Lot of Lonesome,” co-written with George Jones. But the album’s high point is Coe’s version of “Take This Job and Shove It,” a song he authored that Johnny Paycheck took into the stratosphere. Coe’s own version is more than credible. It lacks the outlaw swagger and big production of Paycheck’s version, but none of its conviction. Family Album is a fine album except for the strange look and feel of its cover and the aforementioned Buffett rip-off, but it’s not the place to start if you are seeking an introduction to Coe.